Line rimmed baking sheet with parchment. Arrange grapes in single layer on baking sheet. Drizzle with 3 teaspoons olive oil; toss to coat. Place shallots on sheet of heavy-duty foil; drizzle with 1 teaspoon oil. Enclose in foil; place in small baking disk. Bake until shallots are very soft, about 1/12 hours, and grapes are shriveled and lightly caramelized, about 2 ½ hours. Cool. Note: Can be made 2 days ahead. Cover separately; chill. Bring to room temperature before using. 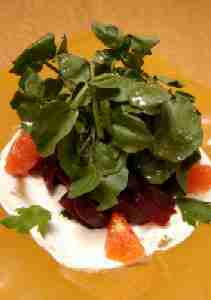 Toss arugula in large bowl with enough dressing to coat. Divide among plates. Top with pears and grapes. Sprinkle with cracked pepper and server.